Jurgen Klopp will "find a solution" to Liverpool's injury issues in defence as they prepare to take on Manchester United without Trent Alexander-Arnold. 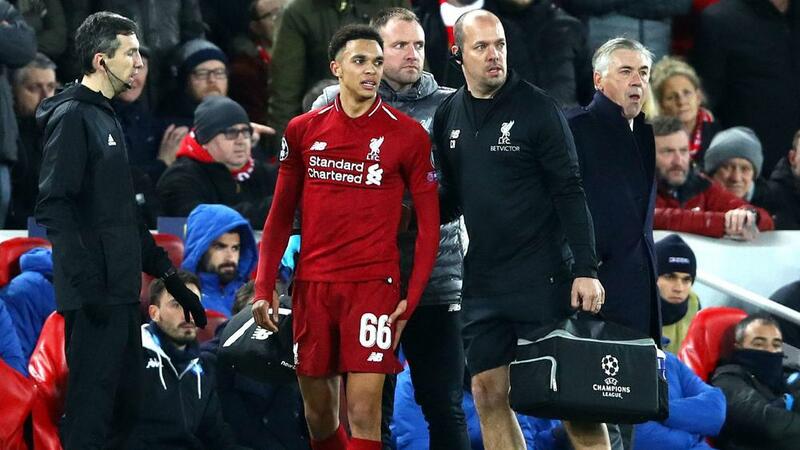 Right-back Alexander-Arnold suffered a foot injury in the midweek Champions League win over Napoli and is set to miss the Premier League fixture with Jose Mourinho's side at Anfield on Sunday. The expected absence of the England international is a further blow for the Reds, who are also short of options at centre-back with Joe Gomez and Joel Matip both sidelined. Gomez suffered a fractured leg against Burnley while Matip broke his collarbone in the closing stages of the midweek fixture in Europe, with the duo out of action until next year. Klopp revealed Alexander-Arnold's situation is not as serious, though his main concern is working out who will replace the 20-year-old against United. When asked if he is facing a defensive crisis ahead of such a huge fixture, the Liverpool boss replied: "No, it's our situation. A crisis is that if you feel it. "With Trent, it's not as serious as the other two boys. It’s not top-class news, that is clear. "It was unlucky, especially with Joel. It was the last second of the game - when I was asked in the press I had no idea about it. Rehab already started pretty much [for Joel], same for Joe. "With Trent, it’s day by day. It’s not good, but as long as we still have enough players, it's our job to find a solution for it – we will have a solution for the weekend, but of course it's not perfect." Klopp could turn to Nathaniel Clyne, who is back in first-team training but has barely figured for Liverpool in the last 18 months. The full-back made just three Premier League appearances in the 2017-18 season and was an unused substitute this term in victories over West Ham and Watford. "He [Clyne] was unfortunately injured in the last two or three weeks, nothing serious but serious enough he couldn't be part of training," Klopp said. "Four days he's [been] in full training again, so that's good. Is he ready for 90 minutes? I don't know. But is he ready? Yes. "He is a very experienced player – is it perfect? No. Is he ready to do it? Yes."